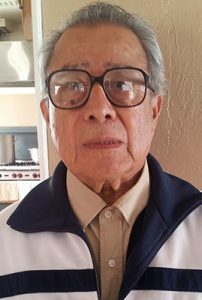 Samuel Sanchez (88) was born July 18, 1930, in Kansas City, Missouri, and passed away November 16, 2018, in Sacramento, California. Orphaned at age five , Samuel was sent to Monterrey, Nuevo León, Mexico, so his grandmother could care for him. He returned to the States at about age 20. Samuel landed a job at the Senator Hotel in Sacramento, where he worked for more than 25 years. He also worked as a custodian from the Sacramento City Unified School District. Samuel married Oralia “Ruth,” and they had four children. He was the rock of his family and taught them all about God and the Church of God (Seventh Day). By invitation from brother Thomas Perez, a member of the CoG7, Samuel started his ministry journey. A compassionate man, he headed the outreach program and involved himself in many other duties, including serving on the board, teaching Sabbath school, conducting Bible studies, preaching, and being a counselor and mentor. If he wasn’t at home, he was at church. Samuel was the last of the original ministers of the Spanish bilingual CoG7 on 71st Street in Sacramento. He is survived by his wife, four children, seven grandchildren, and eleven great-grandchildren.